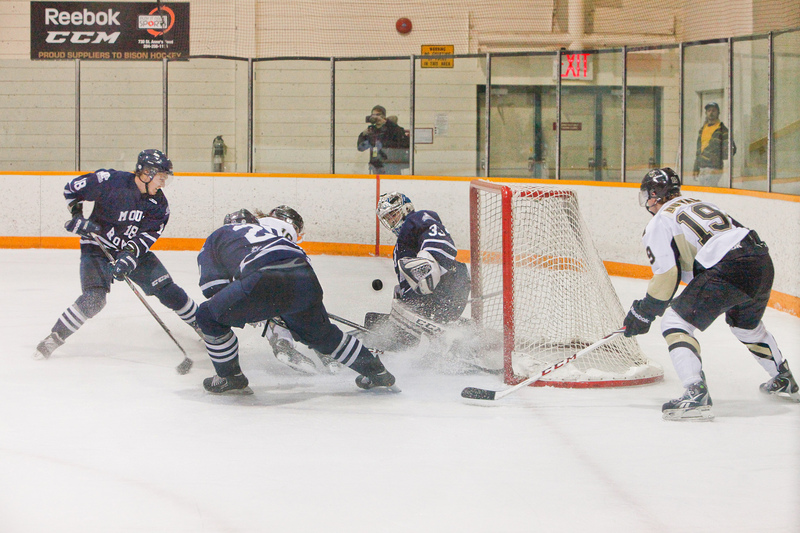 The men's hockey team lost both of their games against the #2 Alberta Golden Bears. A couple of Bison teams were on the road in Alberta this weekend. The University of Manitoba football team lost 36-27 in Calgary against #2 University of Calgary Dinos. The Bison men’s hockey team was a few hours north in Edmonton for a pair of games against the #2 University of Alberta Golden Bears. They lost both games to the powerhouse Golden Bears. The last time the Dinos and Bisons took the field, it was a day to forget for Manitoba, as the Dinos beat up the herd 76-1 7. This time around, the Bisons managed to hold a lead late into the fourth quarter but eventually fell 36-27. Ultimately, the Dinos proved too much for this plucky Bison team, scoring 16 unanswered points in the fourth quarter. Bison wideout Jesse Walker had his best performance of his career, with six catches for 113 yards and a touchdown. Calgary got on the board with their first drive, a 15 yard Karl Hunter catch from Adam Sinagra. The Bisons answered back with a 41-yard field goal to cut into Calgary’s lead. The next Dinos possession, Brock Gowanlock forced a fumble to give the Bisons the ball back. Walker connected with Des Catellier for a 20-yard score. Bisons led 10-8 at the end of the first quarter. Calgary scored a touchdown on their first possession of the second quarter to regain the lead. Each team exchanged a couple safeties and field goals to make the score 20-14 Calgary at the half. On Manitoba’s second possession of the second half, Theo Deezar dived for a one-yard touchdown. That was set up by a 35 yard catch from Walker – his longest of the day. A pair of Brad Mikoluff field goals made the score 27-20 at the end of the third quarter. It was all Calgary in fourth quarter, with the prehistorics tallying 16 unanswered points to remain undefeated on the year. Manitoba drops to 1-5, with #7 University of British Columbia at Investors Group Field on Saturday, Oct. 21 at 2 p.m. The #2 Golden Bears are always a formidable opponent, as they have won the Canada West championship four of the last five years. Manitoba has managed to have success against Alberta the last couple years, however. The Bisons and Bears have split their last eight meetings since 2015-16, with Manitoba winning the season series in 2015-16. On Friday, Manitoba faltered late and lost 5-2. Bison forward Nick Zajac did all the scoring for the Bisons, with Justin Augert in on both tallies. Zajac opened the scoring for Manitoba, but Alberta answered back a few minutes later to tie things up. Alberta’s Jamie Crooks scored the lone goal in the second period, to give the home team their first lead of the day. 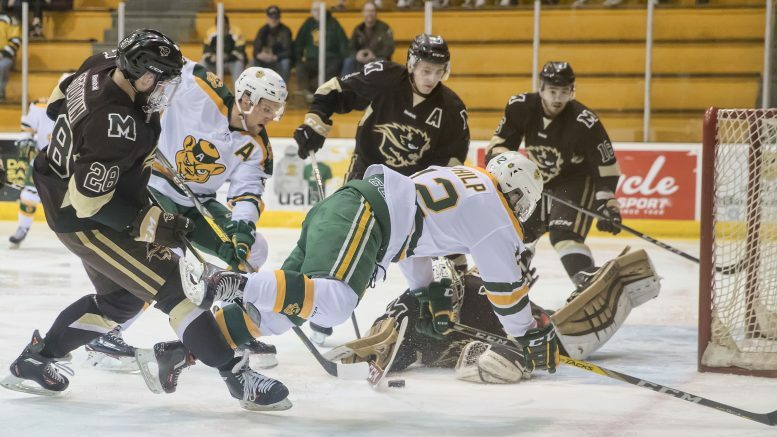 The Golden Bears outscored the Bisons 3-1 in the third period to give Alberta the two points. Bison goaltender Byron Spriggs stopped 32 of 37 shots he faced in the loss. On Saturday, it was all Alberta in a 4-1 win, to sweep the weekend series. Adam Henry scored the lone goal for the Bisons in the second period. Spriggs was once again busy in the crease, making 33 saves in the loss. Things do not get any easier for the Bisons, as national finalists, the #3 University of Saskatchewan Huskies, come to the Wayne Fleming arena this weekend.